Sometimes, I don’t have time. Sometimes, not only do I not have time, I don’t have the energy, wherewithal, or motivation to either go out, go grab fast food, or put together a “real” meal. And frozen dinners are not my favorite. I am a fan of noodles though. I also like chicken, onions, and a modicum of veggies. When I tumbled across this recipe, I snagged it because…reasons! Like it’s easy peasy. It’s fast. It’s yummy. And I usually have all the ingredients on hand. 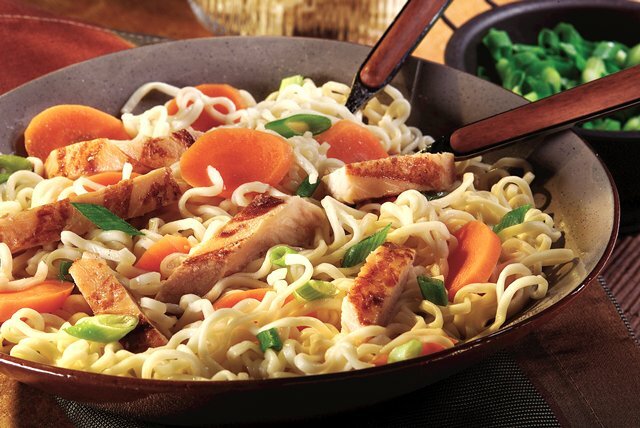 Ramen noodle soup mix adds instant Asian-style appeal to this 15-minute chicken and noodles dish. Bring water to boil in medium saucepan. Add Noodles and carrots; stir. Cook 3 min. Add chicken and 1 tsp. Seasoning (from ramen soup package); mix well. Cook 5 min. or until heated through, stirring occasionally. Discard remaining seasoning. You can CLICK HERE to get nutritional information about the recipe. I would probably double the ramen noodles, might add a handful of frozen peas to go with the carrots–and FYI, I use shredded carrots that I buy packaged, and I might just add a little teriyaki marinade. This is a great meal for one or two when you’re in a hurry and want something relatively homemade. 😉 This is very much in Hannah’s wheelhouse, though she informs me that she IS, with help from Jacey, Annie, and Izzy, learning to to actually cook real food. I know Hannah is a favorite character for many of you. Me, too! If you haven’t read the beginning of her story, you can get a head start with MOONSTRUCK: SECRETS. This entry was posted in Writing Life and tagged characters, food, links, Moonstruck, Moonstruck: Secrets, recipe, Tuesday Treats. Bookmark the permalink.